We Stand with Wisconsin Workers” was the message from 15,000 workers and community allies at the March 26 “Our Communities, Our Good Jobs” march through downtown Los Angeles and rally at Pershing Square. Wisconsin Professional Firefighters Association President Mahlon Mitchell was on the lead banner and spoke to the rally. He called on workers to “stay in the streets” to win. A mini-rally at a Ralphs grocery store on the march route put the full support of regional unions on the side of the Food and Commercial Workers in their current contract negotiations. Bosses forced a 20-week strike in 2003-2004. Across the state of Wisconsin the sweeping people’s rebellion continues every day. From all areas of the state poor and working people are in motion to defeat the union-busting bill Gov. Scott Walker signed March 11. The fightback now encompasses broader demands, as people are directly challenging the billions of dollars in budget cuts politicians like Walker have proposed at the behest of banks, corporations and the Pentagon. The people’s mass resistance on numerous fronts won a temporary victory on March 18. Dane County Circuit Court Judge Maryann Sumi ordered a temporary injunction against the bill that was illegally rammed through the Wisconsin Assembly and Senate on March 9 and 10, respectively, and then signed by Walker. Sumi evaluated a complaint filed by the Dane County District Attorney’s office arguing that Republicans in the Wisconsin Legislature violated state open meetings requirements when they approved the law. The next court hearing on the complaint is scheduled for March 29. On March 21 the Wisconsin Attorney General appealed Sumi’s ruling to the Wisconsin Court of Appeals, asking it to strike down the temporary injunction by March 25, the day the bill is to be published. People are planning on packing the courts on all dates. Labor unions and other organizations are moving on both legal fronts and through direct action to overturn the illegal bill and to fight Walker’s 2011-13 budget, which cut billions of dollars from programs that service millions of poor and working people. Ed Childs, chief steward of UNITE HERE Local 26 in Boston and a member of the Bail Out the People Movement, was in Wisconsin March 15-20. He spoke in Milwaukee and Madison at labor, community and student meetings and often visited the student occupation at University of Wisconsin-Milwaukee. He was usually accompanied by American Federation of State, County and Municipal Employees Local 82 President Gilbert Johnson, members of Students for a Democratic Society, and members of BOPM from Detroit and North Carolina, who also came to Wisconsin to support the struggle. Added Childs: “Workers and students have to keep moving because it is a war, and we have an opponent that has trillions of dollars, and [that opponent is] going to do everything [it] possibly can to defeat us. Workers and students are learning every day what needs to be done and what can be done, and we are doing it. Workers and students want to move; they want to move drastically. They want to win. On March 19, the eighth anniversary of the U.S. invasion of Iraq, joint labor and anti-war actions took place in both Milwaukee and Madison, and individuals and organizations opposed the new U.S. war on Libya as well. In Milwaukee, Tom Burke of the Committee to Stop FBI Repression also spoke out against the government harassment of anti-war, solidarity and union activists. Later that day in Madison, students of color marched to the Capitol, then spoke out against the government’s war on people of color. That war includes attacks on immigrants and ethnic studies. The students also proudly demonstrated their artwork and spirited cultural performances. Wisconsin Works had nothing to do with providing single mothers with decent-paying jobs and childcare. Instead, it had everything to do with driving thousands of single mothers into deeper poverty with either low-wage jobs or a pittance of cash assistance. It had a devastating impact across the state, but especially in Milwaukee, where 68 percent of Wisconsin’s African-American population lives. This cruel, reactionary legislation was funded by the right-wing Heritage and Bradley foundations. Fourteen years later, the effects from W2 are still being felt in the 26th most populous city in the U.S. In 2010, 40 percent of all evictions in Milwaukee were of African-American women, especially single mothers. Milwaukee has an overall unemployment rate of close to 27 percent — almost triple the official national rate. This figure is second in the U.S. only to Detroit. Milwaukee is suffering from a 53 percent unemployment rate among African-American men. Other genocidal conditions in Milwaukee include growing poverty, homelessness, incarcerations, public school closings and police brutality. Black workers, especially women, have depended heavily on public sector jobs to help them get out of poverty, own a home, send their children to college, and retire with a livable pension like all workers should. Losing their jobs to anti-union bills and devastating budget cuts is creating a deeper crisis within the Black community in disproportionate numbers. The ongoing struggle in Wisconsin is an important lesson that shows the need for building grassroots labor/student and community alliances. Class solidarity with the oppressed city of Milwaukee has to be the number-one priority in the mass fight against union busting, budget cuts and racism — all divide-and-conquer tools of the capitalist bosses and their bought-and-paid-for politicians like Walker. When unions in Washington, D.C., found out that the BRG Group, a Republican lobbying firm, was hosting a $1,000-to-$5,000-a-head fundraiser on March 16 for Wisconsin legislators, they put union solidarity into action. They knew the legislators were coming to collect their rich reward from wealthy anti-union benefactors for passing the bill that would strip public sector workers of their collective bargaining rights. Just as unionists and students took over the Capitol in Madison, Wis., several thousand D.C. union members and their supporters broke through security lines and took over several floors of the atrium in the building housing BRG’s fundraiser. Unionists hoisted a banner demanding “Respect workers’ rights” on the second-floor railing, held a sea of signs like “Stop the war on the workers,” chanted slogans like “What’s disgusting? Union busting!” and held an hour-long rally there. 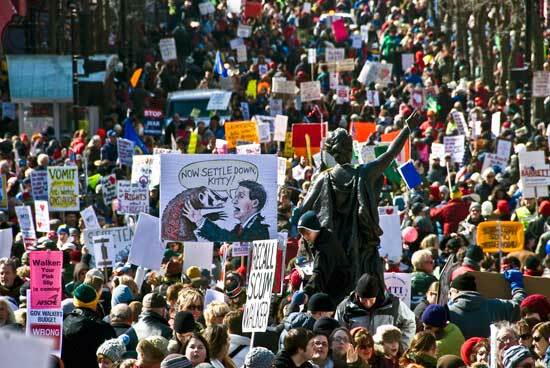 Escalate mass action to kill Wisconsin anti-union bill! The passage of right-wing Gov. 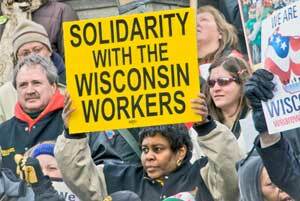 Scott Walker’s union-busting bill should not be the end of the story in Wisconsin. It should be the beginning of a new phase of escalated struggle by the unions, the community and students to overturn this illegal denial of workers’ rights. Walker and the right-wing Republican state legislative group are outright tools of the banks, the bondholders and corporations that are rolling in money and still putting their profits before union rights and people’s needs. There are many grounds on which to base a mass fightback to overturn this bill: It is illegal under international law; it was passed illegally; it denies fundamental rights of unions and all workers, and it attacks communities and students. There are many ways to fight back and time to prepare. But the most important and decisive ways to fight back involve the collective united action of the unions in alliance with communities and students and youth. It will take direct action to stop “business as usual” until the law is repealed —whether by some kind of general strike, mass direct action or another form of struggle. The politicians and their corporate backers must be made to pay a high enough price that they will withdraw this reactionary, anti-worker, anti-people law. Collective bargaining is a civil right and a workers’ right. Without collective bargaining rights, a union is defenseless and will soon perish. The states in the South, where collective bargaining rights are denied, have the lowest union density in the country and are also the poorest. Collective bargaining rights ultimately boil down to the right to food, housing, medical care, education and a decent retirement — that is, the right to live a decent life. No right-wing legislator, acting on behalf of millionaires and billionaires, has the right to deny union rights. The great outpouring of unions and workers all over the state and coming from other states, as well as strong student support for over four weeks, has electrified union members, communities and students all over the country. This has created very favorable conditions in which to launch a further struggle to overturn the law. Walker has said he wants his “PATCO moment.” When Ronald Reagan crushed the 18,000-member Professional Air Traffic Controllers Association in 1981 by firing all of them and barring them from federal employment for life, that union and its cause were little known to the public. Breaking the union at that time evoked no mass support or resistance. The opposite is true today. The Wisconsin public employee unions have ignited a firestorm of union support that has spread to every city and town in the state and across the country, from coast to coast. The unions can count on widespread support and solidarity if they decide on a general strike or some other form of fightback. There are many forms of a general strike. In 1934, in classic, full-scale municipal general strikes, the longshore workers won the right to organize in San Francisco, the Teamsters won the right to organize in Minneapolis, and the Auto-Lite workers won the right to organize in Toledo, Ohio. The Wisconsin’s South Central Federation of Labor has given out information about a state-wide rolling general strike in Ontario from 1995 to 1998. It provides a recent model that lays out in detail the necessary preparations for and execution of this type of strike. During that period there were 11 “Days of Action,” which ultimately pushed back the Ontario government’s proposed anti-labor, austerity program. Whatever actions are decided on going forward, the most important aspect is that the workers and the broader masses supporting them stay mobilized in one way or another. A general strike, even a one-day strike or a series of short strikes, takes the greatest preparation. But as long as the unions, the communities and the students stay engaged and work toward the closest unity and organization, taking the necessary time to plan their campaigns, they can win. In the meantime, demonstrations around the state and the country can lay the groundwork for a much bigger struggle. Right now all public service workers are under attack. They have suffered a setback in Ohio, where anti-union legislation has passed the state Senate, but this can be reversed through struggle. There are battles coming up in Indiana and Michigan. Dozens of state governments are waiting to see the outcome in Wisconsin. The bankers are rooting for Walker. 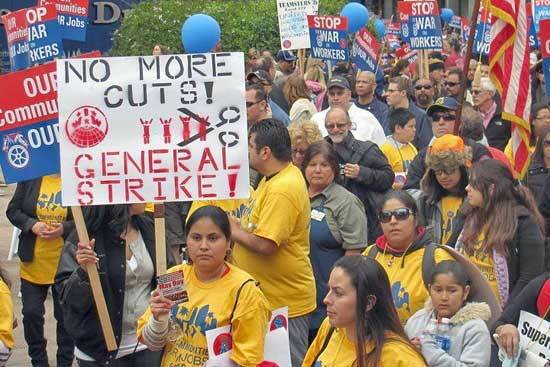 Right-wing politicians are sharpening their legislative knives, hoping to cut the throats of the public worker unions. Wisconsin is where unions and their supporters have made the strongest challenge. Union rights have been under attack in the U.S. for 30 years. But because Walker has made such a vicious attack, Wisconsin is both the flashpoint of the struggle andthe place where the workers are the strongest. When Walker tried to mobilize popular support for his program, only a few hundred Tea Party types showed up for a day or two. They soon disappeared under the pressure of the tens of thousands of pro-union demonstrators who showed up day after day, week after week. Walker has a right-wing legislative majority, but he and his cause are overwhelmingly in the minority among the active masses of the population. And in a real struggle, this is what counts. As a moment of decision on struggle approaches, there are many who will point out the great legal difficulties that public employees face regarding strikes and mass action. It is important to note, though, that it was once illegal for public employees to form a union at all. Only strikes and struggles overturned the laws barring public employees from organizing in the first place. The struggle of the poor and working people in Wisconsin against union-busting and anti-people attacks has ushered in a new period of fightback and resistance in the United States from coast to coast. On March 12, in possibly the biggest progressive demonstration in Wisconsin’s history, tens of thousands of people from across the Badger state, the country and worldwide joined to protest the illegal passing and signing of a union-busting and anti-people bill at the state Capitol in Madison. “In the biggest rally in Madison since the protests started [Feb. 14], hundreds of thousands of working families, small business owners, farmers, students, religious groups, women’s rights groups, environmentalists, private sector workers and public sector workers gathered to say that worker rights are human rights and they must be protected,” says the Wisconsin AFL-CIO on its blog (wisaflcio.typepad.com). The AFL-CIO estimated the crowd at 185,000. Students were also out in force as they have been all along. Students for a Democratic Society marched with a lead banner reading, “No cuts to education: No fees, no layoffs; education is a right!” SDS, with campus unions and community organizations, has organized numerous walkouts and other protests at the University of Wisconsin-Milwaukee over the past month. TheUptake.org reports that on March 11 students across the country walked out of classes in response to a call from Madison students for a national strike. Unionized teaching assistants at UW-Madison and UW-Milwaukee, along with students from K-12 and higher education from all across the state and beyond participated on March 12. Members of labor, student and community organizations from larger cities like Milwaukee to small, rural towns came to fight against union-busting and other political, economic and social attacks against poor and working people included in Gov. Scott Walker’s 2012-13 budget proposal. Speakers at the main rally also included Green Bay native Tony Shalhoub, star of ‘Monk;’ the Rev. Jerry Folk; Phil Neuenfeldt, Wisconsin AFL-CIO president; Tom Buffenburgar, IAMAW president; Marty Biel, executive director AFSCME Council 24; Guy Costello, teacher in the South Milwaukee School District; Heather Terrill-Stotts, principal, Arena Elementary School; Christine Neumann Ortiz, Voces de la Frontera, executive director; Anna Zachow, SEIU Healthcare home worker; Mahlon Mitchell, firefighter president; Jeff Myers, AFT; Sheila Cochran, Coalition of Black Trade Unionists; and Mary Bell, president of WEAC. Both within the U.S. and internationally, solidarity with the poor and working people of Wisconsin and across the country is on the rise. On March 12, members of the German telecommunications union, ver.di, rallied to support bargaining rights for workers in the U.S., and the ver.di chairperson wrote a protest letter to Walker. Wisconsin state AFL-CIO secretary-treasurer, Stephanie Bloomingdale, spoke in Toronto on March 14 and shared her experiences with the Canadian Union of Public Employees. The Wisconsin AFL-CIO receives letters, donations and more on a daily basis from unions across the U.S. and beyond. Solidarity demonstrations have taken and are taking place across the U.S. and internationally. Egyptian workers, a beacon of hope and inspiration to the poor and working people of Wisconsin, have sent donations for food and other assistance. Every day protest actions large and small are taking place throughout Wisconsin. Union federations and locals worldwide are passing support resolutions such as the one entitled, “Support the Initiative for a General Strike in Wisconsin — and Prepare for Nationally-Coordinated Solidarity Job Actions,” adopted unanimously March 2 by the National Association of Letter Carriers Branch 214. This resolution adds to one passed by the 46,000 member South Central Federation of Labor in Madison Feb. 21 (http://scfl.org/). Stephen King, the Rev. Jesse Jackson and many others have spoken, marched, and/or raised funds for the workers in Wisconsin and other states under siege by the banks, the corporations and the Pentagon. Michael Moore, who spoke in Madison on March 5, gave a talk entitled, “America is Not Broke” demanding the rich pay up and calling for massive direct action resistance from poor and working people nationwide. Walker proposed his “budget repair bill” on Feb. 11, which called for virtually eliminating collective bargaining rights for up to 200,000 public sector workers in Wisconsin. Walker wanted the bill rammed through the Wisconsin Legislature in five days — but an 18-day mass occupation of the Capitol and massive demonstrations, and walkouts, sickouts and other student-worker rebellions statewide stalled the bill for weeks. Fourteen Democratic senators left the state to deny Walker a quorum in the Senate and delay the vote. On March 10 the Assembly was unable to convene until afternoon as hundreds of mostly students occupied the lobby leading to the Assembly chambers; some also occupied the Assembly chambers. After a host of police physically dragged out the protesters, the Assembly convened and passed the bill. Tens of thousands of protesters on the outside of the Capitol were illegally barred from entering the the Capitol by hundreds of police on March 10 — despite a court injunction won against Scott Walker’s administration the previous week stating that the public must have access to the inside of the Capitol from 8 a.m. to 6 p.m.
After the Assembly illegally passed the illegal bill on March 10, Joe Conway, president of the Madison firefighters’ union, said that the political situation has grown so dire in Wisconsin, he’d support a general strike. Anti-war forces in Madison demand ‘Jobs, not wars! From the beginning of the people’s struggle against Wisconsin Gov. Scott Walker’s “budget repair bill,” at the behest of the banks, corporations and the Pentagon, thousands of peace and anti-war forces have traveled to Madison and other parts of the state to confront the politicians’ and their rich backers’ lie that there’s no money for people’s needs. The United National Anti-War Committee sent a solidarity delegation to Madison for the tens-of-thousands-strong Feb. 26 protest at the state Capitol. UNAC members from Minnesota, Illinois, Vermont and Virginia carried a 25-foot banner that read, “Stop the war on unions, Muslims, immigrants and communities of color!” They passed out thousands of fliers linking defense of unions with opposing wars abroad. The UNAC statement concludes by demanding, “Money For Jobs, Not War!” and calling on poor and working people to support, build for and attend the anti-war rally and marches in New York City on April 9 and April 10 in San Francisco. Go to UNACPeace.org to read their entire statement of solidarity with Wisconsin workers. U.S. Labor Against the War states, “Solidarity with Public Workers in Wisconsin Is a Stand for Public Workers and Labor Rights Everywhere.” (uslaboragainstwar.org/). Other organizations also sending solidarity delegations to Madison are Veterans For Peace, the Wisconsin Network For Peace and Justice, Peace Action Wisconsin, Courage to Resist, the Answer Coalition, the International Action Center, the Michigan Emergency Committee Against War & Injustice, Stop FBI Repression and Women Against Military Madness.